A reporter who illuminated the constraints on Obama administration cabinet officials and another who exposed mistreatment of veterans received Gerald R. Ford Journalism Prizes at a June 2 award ceremony at the National Press Club. The prizes, sponsored by the Gerald R. Ford Presidential Foundation, recognize distinguished reporting on the presidency and national defense. Glenn Thrush, a reporter with Politico magazine, won for his coverage of the White House, including a cover story in the inaugural Politico magazine, “Locked in the Cabinet,” which depicted frustrations endured by cabinet secretaries as they had their agendas shaped by the White House. Steven M. Ford, chairman of the foundation and the late president’s son, said that the award for coverage of the presidency recognizes a reporter’s “ability to go around the PR barriers at the White House” and that Thrush’s work exemplified the skill needed to get to the real story. David Philipps, a reporter with The Gazette in Colorado Springs, Colo., won the Ford award for coverage of national defense issues for his series on military veterans injured in war who were wrongly denied benefits after leaving the service. Robert Schieffer, a CBS News reporter and host of “Face the Nation,” said that Philipps’ reporting, which preceded the current controversy over medical treatment provided at veterans' hospitals, demonstrates the importance of hometown journalism. 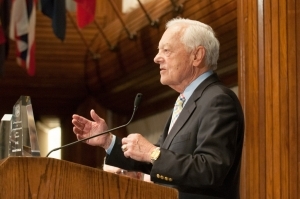 Schieffer reminisced about President Ford during his keynote talk. He said that he, like most of the White House press corps and nation, was shocked when Ford pardoned President Richard Nixon shortly after Ford assumed the presidency in the wake of Nixon’s resignation over the Watergate scandal. In retrospect, Schieffer said that he realized that Ford made the best decision. A Nixon trial would have enervated the country for two years or more. Ford, who served as president from 1974-76, also restored respect for the White House and imbued it with a sense of fun and humor, according to Schieffer, after it had been embroiled for years in Watergate.